Stellar Blue is excited to announce the recent launch of a new custom website for Furniture Solutions, Inc. Based out of Appleton, Wis., Furniture Solutions is a family-owned and operated company that provides top-quality furniture and custom design services to clients. This is Stellar Blue’s first project with Furniture Solutions. When visitors come to the website, they will experience a clean and simple, yet professional, design that calls attention to Furniture Solutions’ various vendors. Visitors are greeted by a slideshow that highlights the beautiful pieces of furniture they offer. The website’s interactive navigation bar allows the user to easily choose the type of room for which they are looking to decorate. Upon choosing the room, drop-down menus appear with the names of specific vendors. As the user scrolls through the home page, they come across more information about the company, details about the custom design services, and a listing of the wide variety of brands they carry. Each page on the website concludes with contact information, store hours, and a social media icon that leads to the company’s Facebook page. 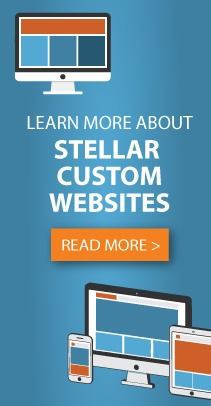 The custom website matches the attention to detail and quality they provide. Built with a responsive design, the website will look aesthetically appealing and display effectively on a variety of devices. Another feature to highlight is the Google Maps integration that gives the user detailed map and driving directions, if they so choose. The website also provides visitors with a contact form, so they can submit messages or questions to Furniture Solutions with ease.